Owner presented “Zoey”, a 13 year old female spayed Labrador Retriever, for improvement in mobility and quality of life. 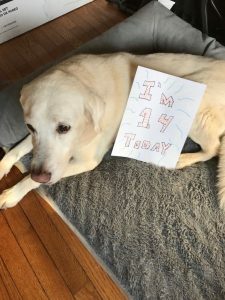 Owner’s medical goal was to have Zoey comfortably reach her 14th birthday in mid-June 2017. During home visits I noted an immediate increase in comfort on gentle palpation after each session. After four treatments the posture of the spine was closer to normal and owner noted improved mobility. The owner was happy that Zoey successfully made it to her birthday with more mobility, family interaction and overall increase in comfort. Zoey was the most senior member of a multi-animal home. She was allowed to eat first and was not pushed around by the other pets. She had a life long history of storm phobia and a recent decline in mobility and interactions with the family. The owner had tried several non-steroidal anti-inflammatory drugs (NSAIDs) as needed with good effect, but was worried about systemic injury. Zoey was on a glucosamine/chondroitin supplement and traditional kibble. The owner had also noted possible weight loss, but declined further diagnostics. No known surgeries or injuries were noted in medical record review or conversation. Bright, alert and responsive to physical stimulation. Normal mucus membrane color and hydration noted. Cardiac and respiration values within normal limits. Decreased vision and hearing noted along with significant dental disease. Muscle mass loss noted on face, shoulders, hips, thighs, and along the length of the spine. Normal neurological reflexes, but difficulty standing up and laying down noted. Reduced range of motion noted during movement. Tension bands bilaterally in the cervical region, shoulders, hips, back muscles and trigger points noted primarily in the triceps, biceps, hamstrings, and quadriceps. Lordosis of the thoracolumbar region noted when Zoey was standing. The approach chosen for Zoey was to focus on the most painful spinal segments, rear limbs, cervical trigger points and increase parasympathetic tone as able. Dry needling was performed so that the pain signals could be interrupted both physically and chemically by altering structural components and pre-and post-synaptic messengers (Leung, 2012). 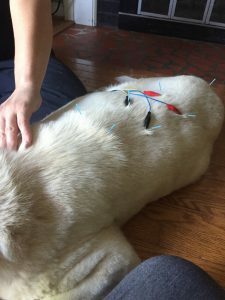 Massage was added to accommodate patient response and further healing based on the positive results presented in the Medical Acupuncture for Veterinarians (MAV) lectures. Electrical stimulation (ES) with different frequencies was added when the unit arrived so that immediate and long term neuromodulation could be achieved (Silvério-Lopes, 2011). Differential diagnoses were based on common breed and age associated conditions that impair normal mobility and decreased muscle mass: single site osteoarthritis with secondary postural dysfunction; multiple sites of osteoarthritis with secondary postural dysfunctions; hip dysplasia with chronic changes; elbow dysplasia with chronic changes; metabolic disease; cognitive dysfunction; neoplasia; and combination of conditions. All putative diagnoses were based on discomfort seen with gentle palpation, enlargement of joints, abnormal gait and lack of normal muscle mass. Zoey was experiencing clinical symptoms of cervical, thoracic, lumbar, elbow and knee osteoarthritis. Skeletal muscle dysfunction secondary to chronic postural abnormalities was also present. Cachexia was noted but no underlying metabolic condition was diagnosed with blood work. Given the state of chronic spinal pain and generalized anxiety several points were chosen to be constant through all six therapy sessions. Coated needles were utilized for each session after negative response to uncoated during first session. After the myofascial exam was completed governor vessel (GV) 20 was stimulated by placing a 0.16x15mm needle for anxiety and decreasing sympathetic tone. GV 14 was stimulated using a 0.2x30mm needle for neck, back and thoracic limb pain as well as immune support. GV 4 was stimulated using a 0.2x30mm for lumbar pain. Bui Hui was stimulated using a 0.2x30mm for lumbar pain. 5/12/2017: Bilateral 0.2x30mm needle placement at bladder line (BL) 17, BL 19, BL 21 and BL 54. These points were chosen based on discomfort on gentle palpation. Several triceps trigger points were addressed with 0.16x15mm needle placement and manipulation. Zoey stood through most of this session. 5/19/2017: Same as 5/12/2017 however only the left side for BL 54 was addressed since she would not stand up or shift sides. Gentle massage of triceps trigger points and tight bands was done in place of needling given Zoey would lay her upper half down randomly. Stomach (ST) 36 was added on the left side to modulate vagal tone. 6/2/2017: Addition of ES to address above and below the major areas of back pain. BL17 to BL19 had bilateral stimulation (not crossing the spine) using alternating frequency to address short term and long term pain pathways (4Hz, 100Hz) for 10 minutes. BL19 to BL23 was then treated in the same manner. ST 36 was on the right side for this therapy session. Using ES to cross the knee joint was attempted but Zoey did not tolerate it and the ST 34 needle came out. 6/16/2017: Same as 6/2/2017 but only tolerated five minutes of ES for BL17 to BL19, but did well with BL19 to BL 23 for 10 minutes. 6/27/2017: Same as 6/2/2017 to include ES times. Discussed NSAIDs and further ES as needed in three weeks. The owner immediately noted that Zoey rested more comfortably and wanted to roam the yard more after the first session. She also noted that Zoey did not seem as anxious with the storms as she had been prior to our first session. By the third treatment the lordosis had been reduced by approximately 60 percent based solely on observation. Once ES was added in we were able to move to every two weeks for therapy, however the owner noted that she appeared more anxious after those sessions. All changes in Zoey’s comfort and mobility came after her first session and no pharmaceutical components were utilized during that time. Multi-modal pain control was discussed at each session. The month following Zoey’s birthday the owner declined further sessions and went back to NSAID therapy. I was recently informed that Zoey was euthanized in August due to declining quality of life. I was impressed with the amount of comfort that was present after the first session. I also learned a great deal about changing each session to match what the patient would tolerate. I would have liked to address multiple avenues of pain control for Zoey, and I hope to be able to better incorporate acupuncture, pharmacological avenues and photomedicine in my everyday practice in the near future. Silvério-Lopes, S. (2011). Electroacupuncture and Stimulatory Frequencies in Analgesia, Acupuncture Concepts and Physiology, Prof. Marcelo Saad (Ed. ), ISBN: 978-953-307-410-8, InTech.